I promise to try to blog regularly. And by regularly, I mean not once every six months. 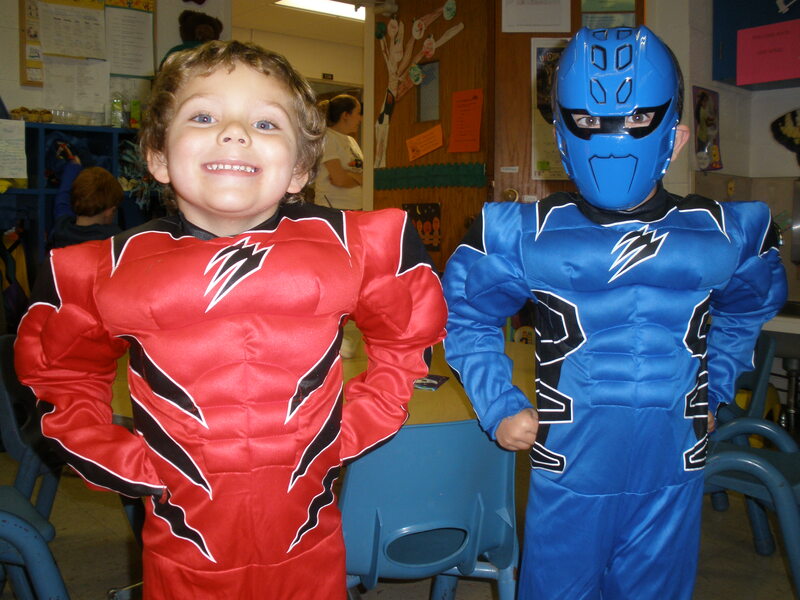 Check out Bug’s “Power Ranger” expression. 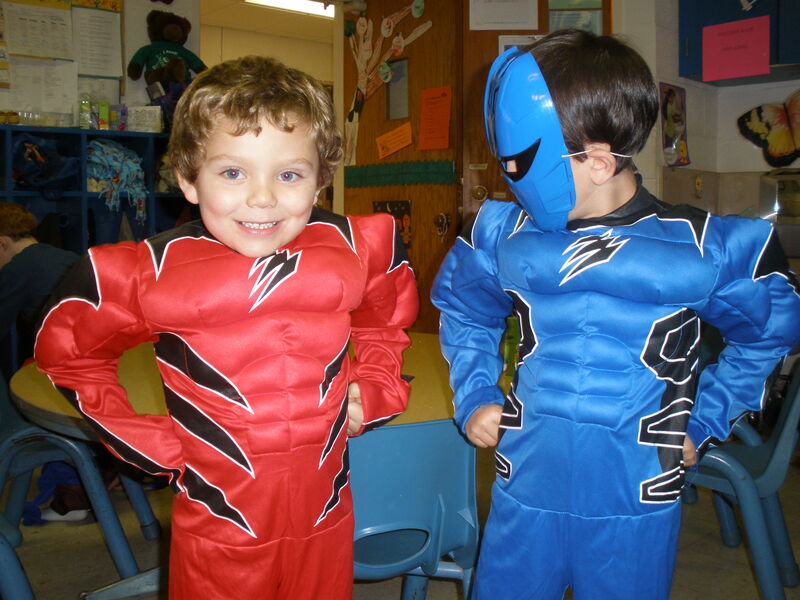 Friday started out with a Halloween party at Bug’s school. 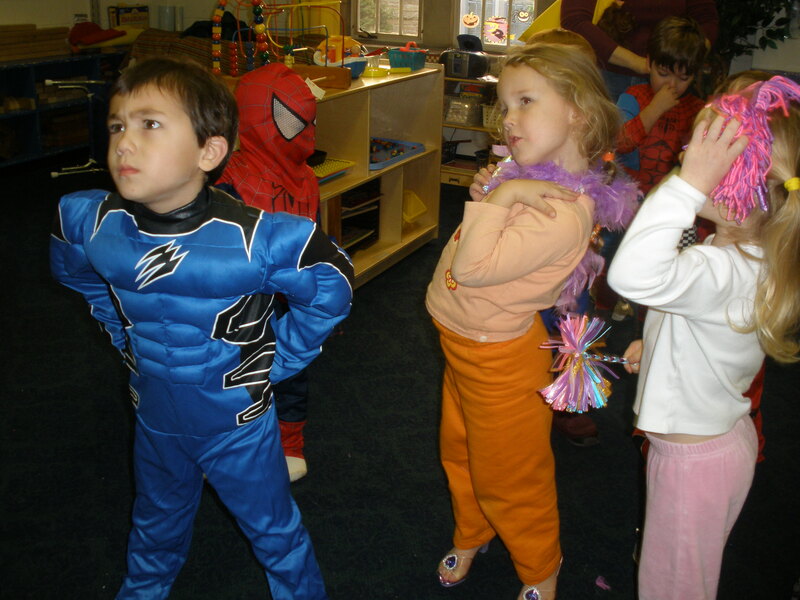 In attendance was Hannah Montana (the little girl in the middle, aptly named Hannah for real), Abby Cadabby (a Sesame Street fairy, or so I’m told), Spiderman, Batman, Iron Man, and a slew of other superheroes who took the day off to partake in some Pre-K Halloween festivities. Bug got to trick-or-treat around the offices at the church, and kid racked up. I’m talking full-size candy bars that people give away when they only expect twenty kids to show up. And toys, stickers, the whole loot. Pretty fancy! After a little bit of pre-Halloween fun, we headed home, where we met Hubs. His boss actually sent him home early so he could participate with the trick-or-treating. This was actually the first time Hubs got to go with Bug, so that was pretty great. They hit up the neighborhood while I stayed home and handed out candy. We had hordes of kids, and by “hordes,” I mean hordes. Parents were driving up and down the streets in pickup trucks and haul-along trailers full of kids. I mean, their sons, daughters, and their entire fifth-grade class. Practically, anyway. We also saw some of Bug’s school friends and church friends that don’t live in the neighborhood, but live nearby out in the country, where the next house is five miles up the road. I’ll have to remember that for next year and plan on surplus! (The real reason to stock up on candy? Leftovers.) We also had some decorative touches (thanks, Mom) that were pretty impressive. We had a skeleton named Boy George that looked like our lawn landed on him and a witch that sang her version of “Girls (Ghouls) Just Wanna Have Fun.” So fun – I love having a neighborhood for this kind of thing! One thing, parents: remind your kids to have manners, even on the spookiest day of the year. I noticed that bad manners bug the hell out of me, especially since my four-year-old remembered to say, “Trick-or-treat!” and “Happy Halloween!” and “Thank you!” every time without prompt. Loved the eight-year-olds who banged on the door, held their bags out, then turned away without a second thought, except that maybe I gave him a Kit-Kat when he really wanted that Reese’s. Seriously. Nothing kills the fun like bad manners. Until next time – which could very well be next summer…HOLLA! I am so impressed by Bug's generosity and good manners. You and Hubs have done WELL. He is so polite. Jono was like that when he was little. He was a quiet, sweet child with manners and kindness. It still shows sometime. Jenn told me that she and a woman and kid from their mommy group took Judah's BIG wagon Grampy Bruce bought him and went trick or treating. Judah and the other child loved their trick or treat candy carriers so much-Elmo, I think-that when someone put candy in it, they'd throw the candy out on the sidewalk. So, the mommies had to go along and pick it up and put it in bags for them. I don't know when Judah will get to eat any of it, as Jenn FORBIDS candy for Judah and God Forbid if you sneak it to him and she finds out. The only time he ate real sugar and no-good sweets was at his first b'day. The pic where Bug is all "OH NO HE DIDN'T" is freakin' hilarious.